At least 13 people were killed Friday and seven others wounded when a public transport van hit the back of a truck on a busy highway outside Mexico City, local officials said. 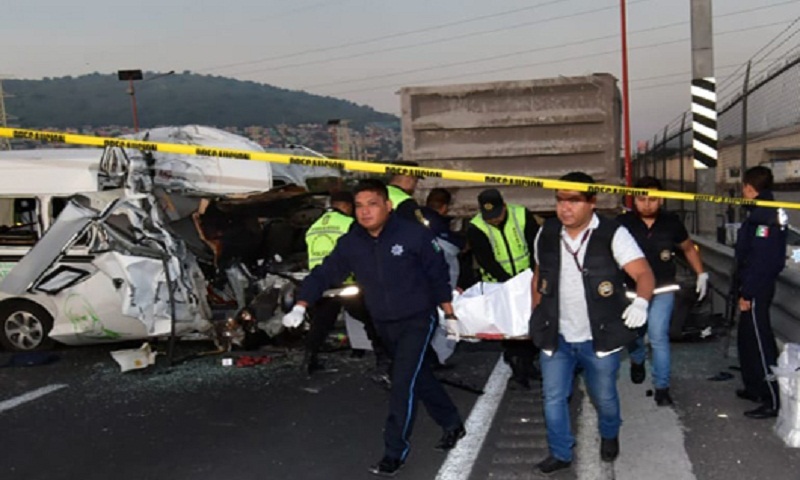 The incident occurred near the city of Ecatepec along the highway that connects Mexico City and nearby Pachuca, about 100 kilometers (60 miles) to the northeast. The highway is one of the busiest in the country. Many Mexicans living on the capital’s outskirts use it for their daily commute to the mega-city. It is also frequented by commercial trucks. Ten men and three women were killed, the security commission spokesman for Mexico state, Edgar Vargas, told AFP. Twelve of the victims died on impact, while another woman passed away after being taken to a nearby hospital. Images showed the van’s front end badly crushed in the collision. “We heard people screaming. I think it was the wounded, calling for someone to come get them out. But we couldn’t do anything because of the fence lining the highway,” said a witness near the scene, Mario Ramirez, 42, who works in a nearby warehouse. He said when he arrived around 7:00 am he saw a heavy police presence and victims lying on the ground. Vans of the kind involved in the crash often carry commuters who live on the outskirts of the sprawling capital to bus or subway stations, where they take public transportation into the city.